Stream and record from up to 16 video channels with the TP-4161R Titan Pro Series 64-Channel 30MP NVR from NUUO at resolutions up to 30MP with throughputs up to 200 Mb/s. Equipped with four hot-swap storage bays, each of which can accommodate an HDD up to 10TB, this NVR supports up to 40TB of total storage . External storage options include PCs via internet connection, network servers, eSATA drives, and USB storage devices. 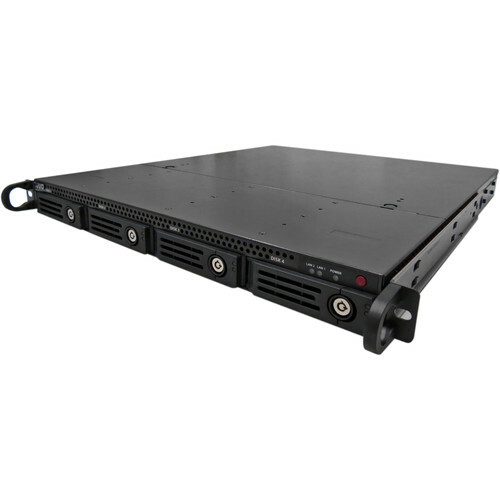 The TP-4161R Titan Pro Series NVR enables simultaneous live viewing of all enabled channels, or simultaneous playback of up to eight channels, via its VGA and HDMI outputs. Network bandwidth use is optimized while ensuring high-quality recording and playback using H.265, H.264, MPEG-4, MJPEG, or MxPEG compression. Bidirectional audio is supported, as is remote monitoring from iOS and Android devices. ONVIF compliance ensures compatibility with a wide range of surveillance equipment. Box Dimensions (LxWxH) 27.4 x 25.0 x 6.85"